Peel and slice garlic cloves. 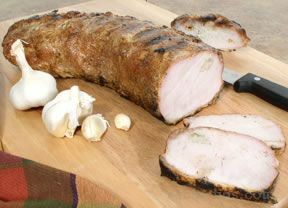 Cut slits into both sides of pork loin and insert sliced garlic in each slit (use about 10-15 slices per side of loin). Rub creole seasoning over entire pork loin. Place pork loin in roasting pan and pour approximately 1/2 beer over pork loin. Cover pan and marinate at minimum of 3 hours, longer if desired. Loin may then be grilled or baked. Oven: bake the loin uncovered at 325Âº F, 20 to 24 minutes per pound. (The internal temperature should read 155Âº - 160Âº F for medium, 165Âº - 170Âº F for medium well.) After removing meat from oven the temperature will rise approximately 5Âº F.